Amazon CEO Jeff Bezos is probably the defining salesman of our time. But in a sit-down with a small group of journalists yesterday that was ostensibly about new Kindle hardware, it became more clear than ever that his company's success has come not from any individual product line, but from one impossibly ambitious strategy: Be everywhere, do everything. It's insane. It's working. We're meeting in a small board room on Amazon HQ in Seattle, and Bezos is giving us the rundown on a few of the more impressive features of the new HDX announcements. He's remarkably casual delivering what's clearly a well rehearsed message—really, he's just a good storyteller, gathering us around him to look over his shoulder as he demos this feature or that—but is noticeably more animated when talking about how Amazon really works. "There are some things that you can only do," Bezos said at one point, "Or only do really well, if you get to play in the entire stack, including all the way down to the hardware and the operating system." He was talking about the ambitious new Mayday technical support button on the Kindle Fire HDX, which provides 24/7/365 live video assistance, but this idea (and really, Mayday itself) is as apt a metaphor as you'll find for Amazon's capacity for success. Mayday was also a chance for Bezos to distill the process of what happens when Amazon decides it absolutely needs to build a device to solve a problem. "This," he said, pointing to a white board he'd filled up at the beginning of the meeting with a Venn diagram of "Customer delight" and "Deep integration throughout the stack". (The rundown of what "the stack" means is scrawled off on the side. Bottom up, it reads: Hardware, OS, Key Apps, Cloud, Services.) And in the middle of the two—between delight and integration—is "where some of the hardest to do, but also the coolest to do things" reside. "And the Mayday button is a perfect example of that." It really is. With Mayday, Amazon is playing "the stack" at both ends. On one side, there's a deep, OS- and hardware-level integration the service itself, which comprises a button in settings that, within about 15 seconds, will have a live customer service technician video-chatting with you, right on your tablet, complete with the ability draw arrows or directions, or even change settings themselves. It requires an incredibly fine level of customization, which Amazon can do because it's building its own hardware, has forked its own version of Android, Fire OS, and has control over a range of services. "In order to get this to work," Bezos says, "We've even had to optimize how we're managing the packets for the video transmission. So this is a very deep integration to make that work." On the other side, this is a truly massive undertaking. Imagine the call centers and data centers and cloud infrastructure necessary to bear the load of millions of Fire owners, at once, pressing a button and summoning a live human being to video chat with them. It's staggering, but also pragmatic, since Amazon is already paying thousands of people to provide Kindle technical support, and this will ultimately make that process easier. It's only possible, though, because Amazon has the money, the clout, and the ambition to build itself solutions to its problems, to fill in any missing pieces of its stack, in a way that every consumer electronics company tries to but few accomplish. As Amazon has grown, that's left it in a position to pinpoint unique opportunities for customer "delight," and leverage its total command of several stacks (or one grand, unified one) to get there. "This is one of the things [Amazon] is uniquely suited to do," Bezos says, "To marry together high tech and heavy lifting. That's really what this is already about." Still, on the surface, this is a strange way to visualize the idea—customer satisfaction, or delight, could just as easily come from that integration itself, no? Especially in an age when consumer tech ecosystems are more tightly guarded than ever. It makes more sense when you remember how focused Amazon has always been on the customer, specifically. Bezos is known to read through individual customer complaints and forward them to his executives, sometimes requiring senior staff to work long hours to figure out an issue only a few people have bothered to report. Like any good salesman, he knows that customers stick with you when then know you'll solve their problems, however big or small. This is Amazon's other biggest philosophy, and strength. You're not a user. Only advertisers really care about users. You are, at all times, a customer, and Amazon is going to treat you like one. It's going to keep selling to you, whenever and wherever you're within a stone's throw of its products. But Bezos rejects the idea that this is inherently—or at all—a negative. The Kindle Fire mantra has always been that Amazon only makes money when you use it. To some, that's like buying a tablet that's eternally asking you if you'd like fries with that. Not so, says Bezos. Even "Buy Now!" features like the instant soundtrack-purchasing options in new features like X-Ray for Movies? "That's convenient!" he fires back, as if from an ejector seat. "Someone's not going to buy something they don't want to buy. But if they do want to buy it, they don't want it to be seven steps when it could be one." It also, incidentally, keeps Kindle Fire hardware prices unprecedentedly low. Fair enough. But it's interesting how committed Bezos and Amazon are to this idea. He went on: "So here's Dan Brown's Inferno. In portrait mode, you get 'the customers who bought this also bought...' information. And it works for videos and books and magazines, newspapers and apps. This is a very much appreciated feature." Knowing how closely Amazon listens to its customers that's probably true. But "much appreciated" ignores the hundreds of think pieces and thousands of angry comments that feature inspired. Which he can do, because—to speak broadly—those probably aren't people interested in listening to his pitch in the first place. Like Amazon itself, Bezos is always pitching. Even throughout mostly casual conversation about the HDX, he reflexively loops back around to his main talking and selling points. Premium product for non-premium pricing. We only make money when you use it. Customer delight. It's hypnotic enough that you almost stop noticing it. This is how invention will probably look for the Fire and Fire OS in the near future. Progress through good, linear hardware upgrades, and software that's uniquely Amazon. One of the principles of Amazon under Bezos is that the internet, even now, is in its infancy. 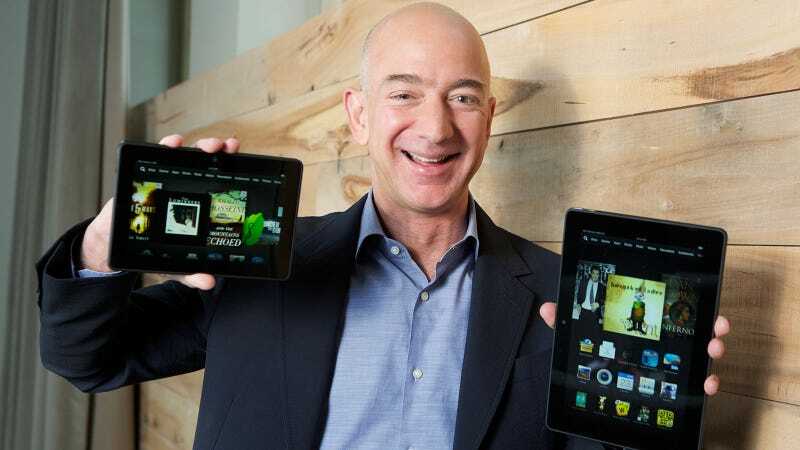 And the tablet especially, Bezos thinks, is immature compared to what it will eventually be. Amazon's already been surprised by how many families and kids are using Fire devices, and how many Fires end up at the office or as productivity machines. "But as we look forward," Bezos says, "I think a lot of the most innovative things are going to come on the software side. I'd say the technology difference between the generation just prior to the Kindle Paperwhite and Kindle Paperwhite is probably a much bigger jump than what you've seen in tablets so far. ...At launch of new generations of products, people tend to get very hardware-focused, but as you see what customers actually do with the devices, the software turns up to be critically important. So things like the Mayday button I think are also important." Mayday represents Amazon's capability to do almost literally anything it sets its mind to. Combine that with the mind-boggling ubiquity of a Kindle app on every platform. To you, valued customer, that can be a tantalizing proposition, as long as you're buying what Jeff Bezos is selling.